Describe the Germanic invasions, the spread of Christianity among Germanic peoples, and Charlemagne's empire. 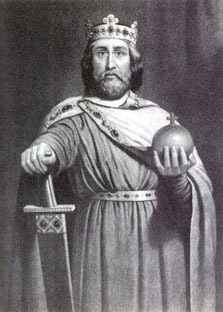 Charlemagne was son of Pepin the Short and grandson of Charles Martel (mayor of the palace of the Frankish Kingdom). When Pepin the Short died, he passed his power to his two sons: Charlemagne and Carloman. Later Carloman died and Charlemagne became the only ruler of the Frankish Kingdom. The first step that Charlemagne took in building his empire was to conquer new territories. The first of these conquering campaigns was against the Lombards, he came out victorious and won the Lombard lands to the north of Italy. Charlemagne also led a victorious campaign against the Saxons of the east. Besides this, he expanded his empire towards southern Germany, southern France, and the island of Corsica. He fought the Avars adding modern-day Hungary and also fought against the moors of Spain gaining the northern part of Spain. Through these conquests Charlemagne united Europe and spread Christianity. Charlemagne’s successful military campaigns were due to his abilities as a military commander and planner, and to the training of his warriors. He controlled his vast empire by sending agents to supervise the different parts of it . Charlemagne was also successful in encouraging learning; he opened schools for the nobles and ordered monasteries to open schools. He was crowned Roman emperor by the pope Leo III in the year 800. As of now, we know what Charlemagne did and how he ruled. The only personal fact we know about him is that he was the eldest son of Pepin the Short and Bertrada of Laon, and brother to Carloman I (he also had a sister named Gisele and a short-lived brother named Pippin). To bring to the table personal components of a ruler's life is to be able to know the ruler slightly better and thus obtaining the possibility of understanding and comprehending the reason behind many of his or her ruling techniques and strategies. Charlemagne's native language isn't quite know, concretely. It is believed that he spoke a Germanic dialect of the Ripurarian Franks or Old High German, for his daughters all received a name from this dialect. It was so difficult for historians to figure out which dialect was his native one, due to where he was believed to be born and around what time. Also, Charlemagne spoke Latin as fluently as his native tongue. He also understood a bit of Greek. He was heavily built, sturdy, and of considerable stature, although not exceptionally so, given that he stood seven feet tall. He had a round head, large and lively eyes, a slightly larger nose than usual, white but still attractive hair, a bright and cheerful expression, a short and fat neck, and a slightly protruding stomach. His voice was clear, but a little higher than one would have expected for a man of his build. He enjoyed good health, except for the fevers that affected him in the last few years of his life. Toward the end he dragged one leg. Even then, he stubbornly did what he wanted and refused to listen to doctors, indeed he detested them, because they wanted to persuade him to stop eating roast meat, as was his wont, and to be content with boiled meat. He used to wear the national, that is to say, the Frank dress: next to his skin a linen shirt and linen breeches, and above these a tunic fringed with silk; while hose fastened by bands covered his lower limbs, and shoes his feet, and he protected his shoulders and chest in winter by a close-fitting coat of otter or marten skins. He despised foreign costumes, however handsome, and never allowed himself to be robed in them, except twice in Rome, when he donned the Roman tunic, chlamys, and shoes; the first time at the request of Pope Hadrian, the second to gratify Leo, Hadrian's successor. Charlemagne had twenty children over the course of his life with eight of his ten known wives or concubines. Before passing, he crowned his only surviving legitimate son, Louis the Pious, and sent him back to his own kingdom. In January, he fell ill and passed on 28 January 814. 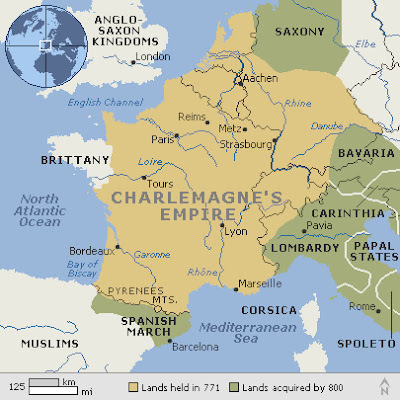 When Charlemagne was 26, he along with his brother Carloman inherited the kingdom of the Franks. Charlemagne, who was characterized for being determined to improve education and religion, and bring Europe out of turmoil. To do this he launched a 30 year military campaign. By 800 he was the ruler of Western Europe and had control of present-day France, Switzerland, Belgium,the Netherlands, Germany, and parts of Austria and Spain.Charlemagne's accomplishments restored much of the unity of the old Roman Empire and paved the way for the development of modern Europe. Charlemagne had very different beliefs from past rulers. He believed that government should be for the benefit of the governed, and he backed up those beliefs in what he accomplished for the people. He consistently tried to improve the lives of his people. He believed in education of skills and religious education. He felt it was important for everyone to have the same educational and religious training as the entire kingdom. On the death of Pippin, the kingdom of the Franks was divided. Charles took the outer parts of the kingdom bordering on the sea namely Neustria, western Aquitaine and the northern parts of Austrasia while Carloman retained the inner parts: southern Austrasia, Septimania, eastern Aquitaine, Burgundy, Provence, and Swabia, lands bordering on Italy. • Disruption of Trade Merchants faced invasions from both land and sea. cities as economic centers. Money became scarce. abandoned as centers of administration. their own food. The population of western Europe became mostly rural. Charlemagne was determined to strengthen his realm and to bring order to Europe. In 772 he launched a 30-year military campaign to accomplish this objective. By 800 Charlemagne was the undisputed ruler of Western Europe. His vast realm encompassed what are now France, Switzerland, Belgium, and The Netherlands. It included half of present-day Italy and Germany, and parts of Austria and Spain. By establishing a central government over Western Europe, Charlemagne restored much of the unity of the old Roman Empire and paved the way for the development of modern Europe. On Christmas Day in 800, while Charlemagne knelt in prayer in Saint Peter’s in Rome, Pope Leo III placed a golden crown on the bowed head of the king. Charlemagne is said to have been surprised by the coronation, declaring that he would not have come into the church had he known the pope’s plan. However, some historians say the pope would not have dared to act without Charlemagne's knowledge. Charlemagne learned to read Latin and some Greek but apparently did not master writing. At meals, instead of having jesters perform, he listened to visiting scholars read from learned works. Charlemagne believed that government should be for the benefit of the governed. He was a reformer who tried to improve his subject’s lives. He set up money standards to encourage commerce and urged better farming methods. The Church had converted many Germanic peoples. These new converts had settled in Rome's former lands. To adapt to rural conditions, the Church built religious communities. In monasteries monks, ''christian men'', gave up their private possessions and devoted their lives to serving God. Monasteries also became Europe's best-educated communities. Monks opened schools, maintained libraries, and copied books.